From clinical counselors to family service specialists, build your career around what matters. Each year, tens of thousands of service members leave the armed forces. Completing an active duty military assignment and transitioning to civilian life can present a host of new challenges for our Veterans and their families. 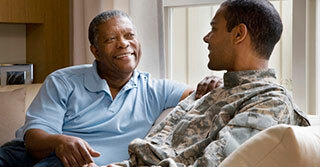 Serco is proud to serve the U.S. military by helping make these transitions, and life after them more manageable. From health and psychological counseling, to marriage and family services, job preparation, and benefits – we provide support for military members and their families. As a counselor, social worker or other advisor, you can help guide our service members toward a fulfilling civilian life. If you have counseling or guidance experience in social work, clinical or family services, career transitioning or VA benefits – and want to make a difference in the lives of our Veterans – this could be the ideal career choice for you. It’s important that we provide our service members with the best care possible as licensed clinical social workers (LCSWs), licensed marriage and family therapists, licensed professional counselors and licensed mental health counselors, clinical counselors, education service facilitators, new parent support home visitors, victim advocates and sexual assault response coordinators. Our Military Social Services and Psychological Health Directorate is a highly regarded and dedicated program, delivering a full range of life cycle solutions to service members – from recruitment and active duty, through retirement. The Veterans Administration Transition Assistance Program (VA-TAP) supports implementation of the Veterans Opportunity to Work (VOW), the Hire Heroes Act and Veterans Employment Initiative (VEI) on behalf of the department of Veterans Affairs (VA). Our advisors provide transitioning service members (Active, Reserve, National Guard), family members, and Veterans a thorough understanding of earned VA benefits, awareness of education and training opportunities, assistance in application processes, and assistance in preparing for civilian employment. Various positions require a Master's degree and an independent license to practice in a clinical capacity as a social worker, psychologist, professional counselor, mental health counselor, or marriage and family therapist. All must have experience providing diagnostic assessment, treatment planning and therapy. These positions support U.S. Government contracts whose terms require Serco to staff them with only U.S. Citizens; applicants must also undergo background investigations.